Nineteenth century Japan is an era most equate with the end of an era. Japan saw the end of the shogun and samurai as it became open to the West. Although it was the end of many cultural practices and traditions, many beautiful artisans were introduced to the West. One such artist was Hokusai. 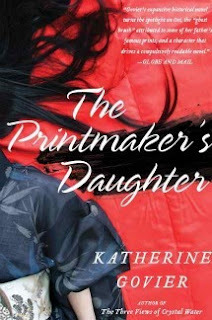 The Printmaker's Daughter by Katherine Govier is a fictional account of the lives of Hokusai and his daughter Ei. Ei Katsushika was the third daughter of Hokusai Katsushika. Ei appears to the much-loved daughter of Hokusai at the beginning of this story. Her father takes her with him around town and affords her freedom that her other sisters never knew. She befriends other artists, poets and even prostitutes in the town of Edo. As she ages, she becomes an indispensable assistant to her father, helping mix paint colors, even working on some of his pictures. In many respects Ei is a free woman in an era when women were never afforded much freedom. She marries, divorces, takes lovers, and assists her father in his work while never learning any of the so-called womanly arts of cooking, making tea, sewing, or even cleaning. Ms. Govier paints a picture of Ei that is often tragic yet filled with wonder. Although Ei has freedom that many Japanese women never experienced during this time period, she remains tied to her father. She puts up with his verbal abuse and has her art demeaned and belittled. As her father ages and becomes either incapable or unwilling to paint, Ei takes over and continues his school and even paints many pictures that are ultimately attributed to Hokusai (some intentionally). Although Hokusai is the best-known print maker of his time, he and Ei lived in virtual poverty much of their lives. Ei's life seemed to come to an abrupt stop when Hokusai finally died. It isn't until she reunites with a former prostitute turned nun - Shino, that she learns to placate society and her family while continuing to do what she wants until her death. The Printmaker's Daughter is at times hauntingly beautiful in bringing the lives of Ei, Shino and Hokusai to life. There were also times the story seemed sluggish, as a result I found myself having to put the book down because my attention kept wavering as I tried to read. It wasn't until the latter portion of Ei's life is portrayed after Hokusai's death that the story truly became interesting for me. Don't get me wrong, The Printmaker's Daughter is a beautiful fictional account of Ei and Hokusai. This is a well-written and well-researched book with well-developed characters and settings. Sadly I found the research discussion at the end of the book more captivating than most of the fictional story. Disclaimer: I received this book free for review purposes from the publisher through NetGalley. I was not paid, required or otherwise obligated to write a positive review. The opinions I have expressed are my own. I am disclosing this in accordance with the Federal Trade Commission's 16 CFR, Part 255: "Guides Concerning the Use of Endorsements and Testimonials in Advertising."